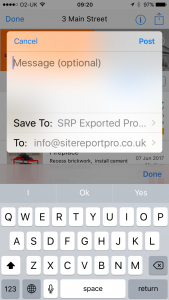 Site Report Pro allows you to export projects from the Application for the purposes of sending the entire project to another Site Report Pro user or for storing a local copy on your computer / server for backup purposes. 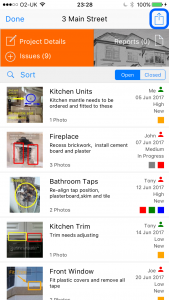 On the projects screen, click the project to be edited. The project screen containing all the project issues (if any) will be displayed. 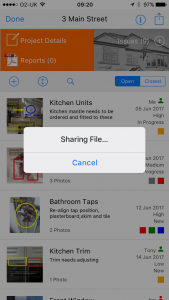 Click the Share icon in the header. Click the Export Project option from the menu. 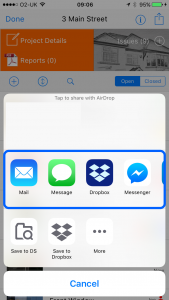 The iOS Share Menu will be displayed and include options available to you on your device. 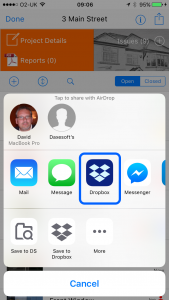 Click the Dropbox icon on the iOS Share Sheet. Enter an optional message, select the folder in which to save the project to, enter the required email address(es) and click Post. 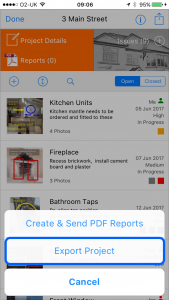 Site Report Pro will then export the project to your chosen folder in Dropbox. PLEASE NOTE: Projects will be exported will a filename such as p1000128.saProject. If you export the same project to the same folder in dropbox more than once, then dropbox will create another file (it won’t overwrite it) and MODIFY the filename with a version number (e.g. p1000128 (1).saProject, or p1000128 (2).saProject). Site Report Pro WILL NOT be able to read these files and so the filenames should be modified (remove the version number in brackets and any spacing) before an import is attempted. If you wish to export multiple version of the same project to Dropbox for the intention, then we recommend you save each version to a separate sub-folder. 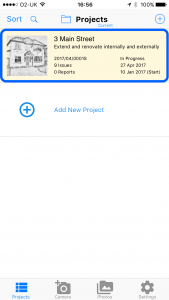 To learn how to import a project into Site Report Pro view the Import Project article.